I haven't done much of anything quilty since I got back from Japan as my sewing room is very hard to get into (all the tidying up from Christmas is in my sewing room). So here is something that caught my eye over the holidays. My son and some of his friends went cycling in the Wairarapa and I was 'support person' for a day. 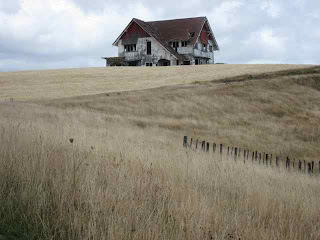 Near Stonehenge Aotearoa (a replica Stonehenge in concrete) is this house which locals call the Ghosthouse. Apparently a local farmer bought the house and transported it to his property in 4 bits. Unfortunately he didn't have the money to get it completely sorted and it has been slowly decomposing ever since the 1980s. 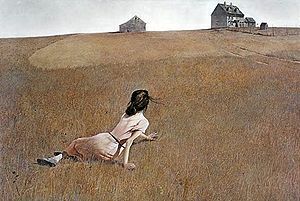 It also reminds me of the Andrew Wyath painting 'Christina's World'. Which seems to be a woman having a picnic in a field until you find out that she is paralysed and has to crawl to the house.